Children can begin learning about American history at a young age. A number of great videos and movies have been created over the years to both entertain and educate children about America's short but illustrious past. Filled with patriotic songs and fun lessons about the founders of America, the country's history and how the government works, these movies are the ideal place to begin your young child's American history education. 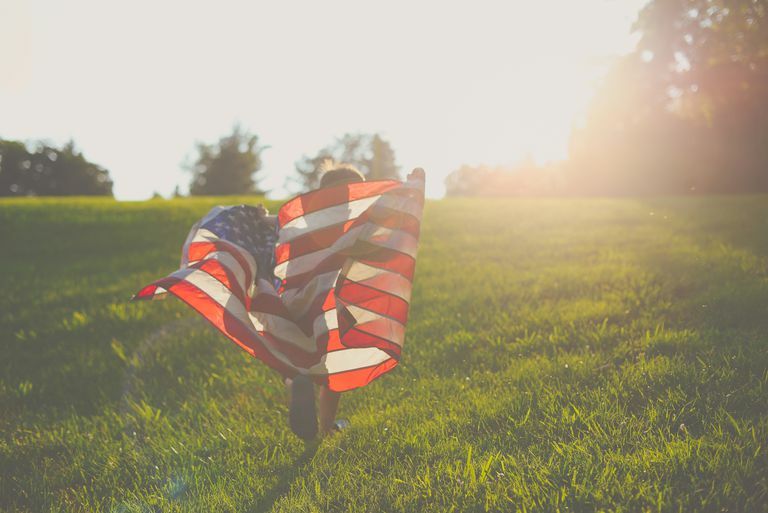 A holiday like the Fourth of July may be the perfect introduction to these videos through your kids will enjoy them year-round. Photo © Disney. All Rights Reserved. "Schoolhouse Rock" was a series of three-minute animated shorts that use music and funny yet educational lyrics to teach kids about grammar, arithmetic, history, science, government and more. The series aired from 1973 until 1986 and again in the early nineties, winning multiple awards. The Election Collection is a compilation of songs related to US government and US history. The menu allows viewers to play all songs or to choose election-related songs by category. With songs like "I'm Just a Bill," the show eloquently explains some of the most complicated processes in easy-to-understand and catchy tunes. This is great for ages 7 and up. Younger kids will still enjoy the songs and cartoons, but the song material might be over their heads. In the late 1980s, Charles Schulz produced a CBS miniseries that found his beloved "Peanuts" characters traveling through time to visit important people, places, and events in U.S. history. This two-disc DVD set includes all eight of the series' episodes, including Independence Day themed Charlie Brown episodes such as "The Mayflower Voyagers," "The Birth of the Constitution," and "The Music and Heroes of America." As a young parent yourself, you may have even grown up watching these as they aired or as re-runs on Saturday mornings. You might even have songs like "Yankee Doodle" that the "Peanuts" gang performed. The "Liberty's Kids" TV series is an animated show which aired on PBS. Aimed at kids ages 7 to 12 years, the series introduces kids to American history through the eyes of two young apprentice reporters named Sarah and James, who experience first-hand the conflicts and events that shaped their nation. Famous names such as Walter Cronkite, Dustin Hoffman, Annette Bening, Michael Douglas, Whoopi Goldberg and more lend their voices to bring history to life for kids. It is designed to help them learn not only about the history but also about the different perspectives people might have had at that pivotal time. All of the exciting and educational episodes of the show are compiled in this remarkable DVD set. Photo © New Video Group Inc. This video collection features animated adaptations of three children's books celebrating the history and geography of the United States. In Laurie Keller's "The Scrambled States of America," pandemonium ensues when the 50 states get together and decide to switch places. Arlo Guthrie sings along to his father's legendary song "This Land is Your Land," illustrated beautifully in America-inspired paintings by Kathy Jakobsen. Also, Aretha Franklin croons a soulful rendition of the national anthem in the animated "The Star Spangled Banner." The DVD edition includes two bonus stories about American heroes John Henry and Johnny Appleseed. Photo © American Animation Studios. From the ​"History's Heroes" DVD series, ​"Paul Revere: Midnight Ride" is a 3-D animated movie that is both entertaining and educational. Ellie the Eagle and poet Ralph Waldo Emerson take a look back in time and relate the amazing story of American hero Paul Revere. Kids learn all about Revere's midnight ride and the famous "shot heard 'round the world." The remarkable presentation of this exciting story will have kids on the edge of their seats as they marvel that such a story really did happen. "The History's Heroes" DVD series continues in this compelling presentation of the story of Patrick Henry in a 3-D animated movie called "Patrick Henry: Quest for Freedom." Boomer the Eagle introduces kids to the founding fathers at the 1775 Virginia Convention. He also helps kids understand Patrick Henry's background and the events that shaped his character and his convictions leading up to the moment he cried those famous words, "Give me liberty or give me death!" "The History's Heroes" DVD series portrays the riveting stories of real American heroes in a way that helps kids see that history can really be fascinating! Photo © 2007 NestFamily LLC, All Rights Reserved. This animated story follows the extraordinary life of George Washington through his days as a military leader and highlights his contributions as "the father of our nation." The DVD comes with a 48-page resource and activity book. This will help your children learn as they are entertained and takes the video one step further. It's a fantastic way to encourage early interest in the history of the U.S.
Photo © NestFamily LLC, All Rights Reserved. This DVD story about Benjamin Franklin focuses mainly on his contributions as an inventor. Kids will learn about his experiments with lightning and electricity and the opposition he faced from those who doubted him. Like the George Washington version, this DVD comes with a 48-page resource and activity book. From coloring pages to puzzles and word games, it promises to offer hours of educational entertainment. Photo © Bald Eagle Media, Inc.
"All Aboard America" takes kids on a fun-filled animated journey with Rudy, a bald eagle and his friends Stars the dog and Stripes the cat. Rudy and his friends take kids on a fun-filled journey to famous landmarks across America, enjoying famous American tunes such as "Yankee Doodle Dandy" and "Home on the Range" as they go. This fun little cartoon has a runtime of approximately 39 minutes and is great for kids ages 2 through 8.